The Shelter Corporation is hosting their International Architectural Design Competition 2018 for students and invites submissions from all around the world. 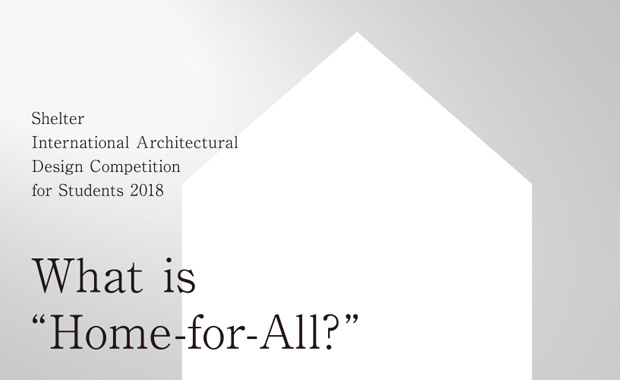 The competition is themed: What is “Home-for-All?”. A total of ¥1,800,000 (Japanese yen) will be awarded in prize money, of which ¥1,000,000 are reserved for the First prize. Certificates of Merit will also be awarded. The “Home-for-All” is a project that is built upon the premise of “thinking together and creating together” with the community. It is an architectural manner that goes further than simply supporting the people affected by the disaster to question the most fundamental meaning of the future of public architecture. I would like students to present proposals that build from and go beyond the concept of “Home-for-All” from a perspective that takes into consideration of people living in our society today. A number of works will be selected at the Initial Jury, which will be held on 27 October 2018, and the results of this jury will be announced on the official website. The authors of the selected works will be invited to present their works, either in Japanese or in English, at an open-jury (the final jury) held in Tokyo on 8 December 2018. The Jury will decide the first, second and third prizes at the open-jury. The works will be published on The Shelter Corporation’s website and in architectural magazines. The Shelter Corporation hosts its student competition with the intention that it will be recognized as the most important architectural competition of its type in the world, and a gateway for young architects students to become World-Class Architects.